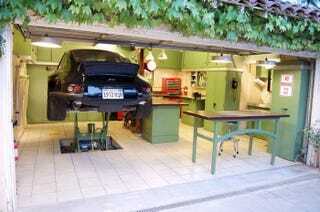 Living in Los Angeles as a car guy typically means either being wealthy enough to afford a garage (i.e. Jay Leno) or flexible enough to wrench in an AutoZone parking lot. Alas, Jack Olsen's managed to find an incredible compromise. Short on space but long on creativity, Jack managed to fit everything a wrench-turner would need with Strong Hold cabinets, some DIY lighting, and a bit of repurposed Ikea furniture. But the best part? That second-hand Vesti hydraulic lift submerged in the ground and tiled to blend into the floor. He paid $455 for it. In the immortal words of Liz Lemon: I want to go to there. And I'll take the Porsche, too.